I think many of you will remember the boom that the crypto industry has made with its large mining farming. People who enter this stream quickly obtain all the necessary equipment and start building crypto farms at home. Hope it brings them a lot of money. However, from the reality of our time, all activists, including those who first bought expensive equipment, are now experiencing some difficulties in this field. Because they do not take into account many indicators that directly affect their income. First, they spend too much money to buy the best graphics card, which costs now ten times less. Second, they do not take into account the ever-increasing utility costs, namely electricity. And, third, because of the decline in the general cryptocurrency market, it became difficult for them to break even, while paying off all of their expenses for the maintenance of their home mining farm. The first Pieta blockchain project in the world that aims to minimize cryptocurrency mining costs and make it even more accessible and environmentally friendly. This will be done using a new X20 algorithm that can reduce energy consumption in blockchain mining, this project will make mining equipment cooler. And can result in an increase in the life of mining equipment and in turn the profits of miners. Pieta has low energy emissions (carbon) which will have a positive impact on the surrounding environment. In addition, Pieta is also committed to encouraging the use of renewable solar energy in the crypto mining process to further reduce costs and save the environment. In fulfilling our vision and values, we recognize our responsibility towards society and the natural environment. We will orient ourselves to the principles of sustainable development. This is an integral part of our Pieta coin because we use the X20 algorithm which helps reduce electricity while getting the optimum security needed and this happens through reducing electricity by cutting 50% of the mining process and as a consequence of energy reduction, we solve security problems by balancing . Pieta will visualize to make Mining profitable and attractive to everyone regardless of individual technological and financial expertise. ● Ensure the assumption of the fast path of the Green Energy Source. ● Make Solar Energy the main energy source for efficient business operations. Pieta aims to be able to shape the regulatory environment and increase business opportunities for solar power throughout the world and to be able to ensure that more energy is produced by the sun than other energy sources and to direct investors, supporters, members and partners to make solar the core from energy systems that are intelligent, sustainable and inclusive. Pieta allows users to engage in blockchain mining which is fast and cost-effective for exceptional returns. ● Multiple Revenue Streams for Pieta token investors and holders, in the form of access to Point of Sale networks from merchants / businesses that accept Cryptocurrency payments (transactions) worldwide. ● Maximize cryptocurrency adoption through futuristic integration with other blockchain. ● High Mining Rewards with much lower investment costs and time. The use of solar energy keeps mining costs low while the X20 algorithm produces more output with lower energy consumption. ● Bonuses – Up to 40%, depending on the stage of the ICO you choose to invest. 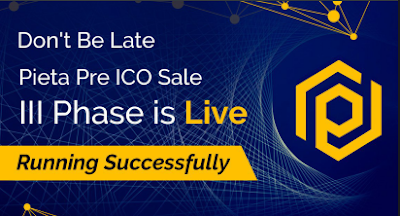 Pieta token supports the blockchain, it will be a loyalty project token and supporters can fulfill the roadmap project while rewarding buyers for their positive contribution contribution and will be acceptable payments / currencies for participating businesses and can also be exchanged to Ethereum depending on user decision.